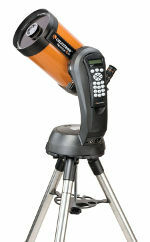 A telescope is the key piece of equipment you need to pursue the hobby of astronomy. Avoid any telescopes that you see in department/hardware/ toy stores or being sold on TV. They are most likely junk. 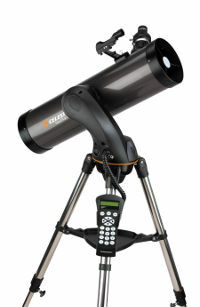 Instead of wasting money on them, you can easily find a better telescope within your budget. There are three types of optical telescopes available to the amateur astronomer. 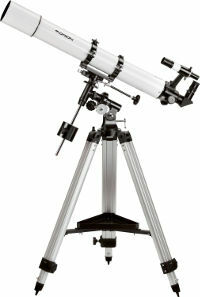 Refractor telescopes are what most people envision when they think of telescopes. They were the earliest type of optical telescopes and are good starter telescopes with the best images. Reflector (or reflecting) telescopes are optical telescopes that use curved mirrors to reflect light and form an image. This type of telescope was invented by Sir Isaac Newton and tends to be smaller/more portable than the refractor telescopes. Catadioptric telescopes combine the principles of refraction and reflection using both lenses and curved mirrors. They are also popularly known as Schmidt-Cassegrain telescopes or SCTs.